The nearest domestic and International Airport is Bangalore Airport (130 Kms from Mysore). Mysore has been blessed with a salubrious climate. One of the largest cities in the state of Karnataka, India. It is the headquarters of the Mysore district and the Mysore division in Karnataka. It lies about 140 km. to the south-west of Bangalore, the capital of Karnataka. Historically, the city was the capital of the Mysore kingdom which was ruled by the Wodeyar family. Various arts and crafts thrived under the kings patronage, leading to the city earning the sobriquet of the cultural capital of Karnataka. Mysore receives a large number of tourists most of whom visit the city during the 10-day celebrations that go on during the dasara festival. Mysore is also known as the city of palaces due to the large number of palaces that are present in the city. The civic administration of the city is managed by the Mysore City Corporation which was earlier established as a municipality in 1888 and later converted into a corporation in 1977. It looks after the engineering works, health and sanitation, water supply, administration and taxation in the city. It is headed by a Mayor who is assisted by Commissioners and council members. The city is divided into 65 wards and the council members (also known as corporators) are elected by the citizens of Mysore in elections held in these wards once every five years. The council members in turn elect the mayor. The annual budget of the Corporation for the year 2007-08 is Rs. 11443.89 lakh ($ 28.6 million). The growth and expansion of the city is managed by the Mysore Urban Development Authority (MUDA) which is headed by a commissioner and its activities include developing new layouts and roads, town planning and land acquisition. One of the important projects undertaken by MUDA is the creation of an Outer Ring Road in Mysore which is expected to ease traffic congestion in Mysore. In recent years, MUDA has faced criticism from citizens of Mysore for its inability to ensure that sites are allotted to domicile residents of the city. The electrical supply to the city is managed by the Chamundeshwari Electricity Supply Company (CESCOM). The citizens of Mysore elect four representatives to the Legislative assembly of Karnataka through the constituencies of Chamaraja, Krishnaraja, Narasimharaja and Chamundeshwari. Mysore city, being a part of the larger Mysore Lok Sabha constituency, also elects one member to the Lok Sabha, the lower house of the Indian Parliament. The politics in the city is dominated by three political parties, Indian National Congress (INC), Bharatiya Janata Party (BJP) and Janata Dal (Secular) (JDS). In the past few centuries, Mysore has been the home of traditional industries like Mysore weaving, sandalwood carving, bronze work and the production of lime and salt. The planned industrial growth of the city and the state was first envisaged in the Mysore economic conference, held in 1911. This led to the establishment of few big industries in Mysore city like the Mysore Sandalwood Oil Factory in 1917 and the Sri Krishnarajendra Mills in 1920. For the industrial development of the city, Karnataka Industrial Areas Development Board (KIADB) has established four industrial areas in and around Mysore. These are located at Belagola, Belawadi, Hebbal (Electronic City) and Hootagalli.. Some of the major industries located in Mysore are BEML, J. K. Tyres, Wipro, Falcon Tyres, L & T and Infosys. The information technology related companies are also slowly creating bases in Mysore, with the city contributing Rs. 760 crores to Karnataka's Rs. 48,700 crore IT exports in the year 2006-2007. Infosys has established one of the largest technical training centres in the world  and Wipro has established its Global Service Management Center (GSMC) at Mysore. The industrial sector in the city had some reversals when the automobile manufacturer Ideal Jawa and the Sri Krishnarajendra Mills closed their operations in Mysore. There have been some revival efforts like the takeover of the Krishnarajendra Mills by the Atlantic Spinning and Weaving Mills Ltd. but these have run into other problems. The Mysore painting form is an offshoot of the Vijayanagar school of painting. The king, Raja Wodeyar (1578-1617 CE) is credited to have been the patron for this style of painting. The distinctive feature of these paintings is the gesso work in which gold foils are pasted on appropriate regions on the paintings. Mysore is also the location of the International Ganjifa Research Centre which is involved in the research of Ganjifa, the ancient card game and the artwork associated with it. Mysore is famous for rosewood inlay work, with an estimated 4000 craftsmen in Mysore involved in this activity. Mysore also lends its name to the Mysore silk saree, a feminine wear, made using pure silk and gold zari. Mysore also has institutes like the Chamarajendra Academy of Visual Arts (CAVA) which offers education in visual art forms like painting, graphics, sculpture, applied art, photography and photojournalism and history of art and the theatre repertory Rangayana, which holds plays and offers certificate courses on subjects related to theatre. Famous Kannada literateurs; Kuvempu, Gopalakrishna Adiga and U. R. Ananthamurthy have had a long association with Mysore because they completed their education and also served as professors at the Mysore University. The famous English novelist and creator of Malgudi, R. K. Narayan and his cartoonist brother, R. K. Laxman spent a large part of their life at Mysore. Newspaper publishing in Mysore started in the year 1859 when Bhashyam Bhashyacharya began publishing a weekly newspaper in Kannada, called the Mysooru Vrittanta Bodhini. This was followed by other weekly newspapers like Karnataka Prakashika (1865), Mysore Gazette (1866) and Vrittanta Patrike (1887). One of the well known publishers in Mysore during the Wodeyar rule was M Venkatakrishnaiya, who is also called as the father of Kannada journalism. He started a number of news magazines like Sampadabhyudaya, Vidyaadaayini, Mysore Patriot and Saadhvi. Currently, some of the popular newspapers which have Mysore editions include Times of India and Deccan Herald in English and Prajavani and Vijaya Karnataka in Kannada. Star of Mysore, Andolana and Mysooru Mithra are some of the local newspapers published in Mysore which contain news mostly related to the Mysore city and its surroundings. Mysore was the location of the first private radio broadcasting station in India when Akashvani (meaning voice from the sky) was setup in the city on September 10, 1935. The radio station was setup by M.V. Gopalaswamy, a professor of psychology at his house in the Vontikoppal area of the Mysore using a 50-watt transmitter. The station was taken over by the Mysore state in 1941 and was moved to Bangalore in 1955. In 1957, the name Akashvani was chosen as the official name of the All India Radio (AIR), which is the radio broadcaster of the Government of India. The AIR station at Mysore broadcasts an FM radio channel at 100.6 MHz. Private FM channels are expected to get started in Mysore by the end of the year 2007. 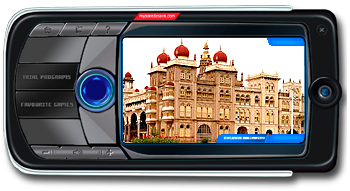 Mysore city started receiving television broadcasts in the early 1980s when Doordarshan started beaming its national channel, all over India. This was the only channel available for Mysoreans till Star TV started beaming satellite channels in 1991. Direct to Home channels are now available in Mysore. Tippu was a great scholar and lover of literature. His artistic pursuits were also many and he made rich gifts to the Hindu temples. Tippu Sultan "Tiger of Karnataka" was killed in 1799 A.D., and the Mysore throne was handed back to the Wodeyar's. The whole of Karnataka came under the control of the British in the beginning of the 19th century. The new state was named as new Mysore and the Maharaja of Mysore was appointed Governor by Independent India. This unified state was renamed as Karnataka on November 1, 1973. Mysore - the former capital of the erstwhile Wodeyars and also of the State of Mysore lost its prominence to Bangalore. The recorded history of Mysore City, which was a principal town of a district, goes back to 10th century AD. After witnessing many vicissitudes and remaining for centuries the headquarters of a small principality, Mysore, for well nigh two centuries lost out to Srirangapatna as a city of any consequence. It was Raja Wodeyar who, in 1610, set up headquarters at Srirangapatna after asserting his independence from the Vijayanagar viceroy. The centre of gravity shifted back to Mysore with the court starting to function once again and the population remigrating to it from Srirangapatna. It was administered under the British Commission from 1831 to 1881 after a spell of governance under the great Dewan Purnaiah, who survived the Hyder-Tippu era. The city really started growing into its present form after the Rendition of 1881 when the throne was restored to Chamarajendra Wodeyar, the scion of the royal family, who ruled the State for 13 years till his death in 1894. Chamarajendra Wodeyar and later the Maharani Regent commissioned a number of important buildings, besides putting some order in the City's by now visible growth. But the credit for its blossoming into the city that we are familiar with goes to the long spell of rule of Krishnaraja Wodeyar, the Saint King and prince among builders, the Silver Jubilee of whose reign was celebrated in 1927. The foundation of the City's spacious and excellently planned layouts had already been laid during the administration of Dewans Seshadri Iyer and M. Visveswaraya. With the Silver Jubilee Spirit of the celebrations of Krishnaraja Wodeyar's rule, the city invested with much of its remarkable aesthetics - new parks and boulevards and some noteworthy additions to its architectural scene. Sir Mirza Ismail (Dewan from 1926 to 1941), a great aesthete himself, did much to enhance the City's aesthetics. Mysore inspite of being ruled by different Rulers and Kingdoms for ages, still retains its old charm and stately beauty. There are many 'not-to-be-missed' sights in Mysore like the magnificent Mysore Palace, Sri Jayachamarajendra Art Gallery, St. Philomena's Church, KRS Brindavan Gardens.